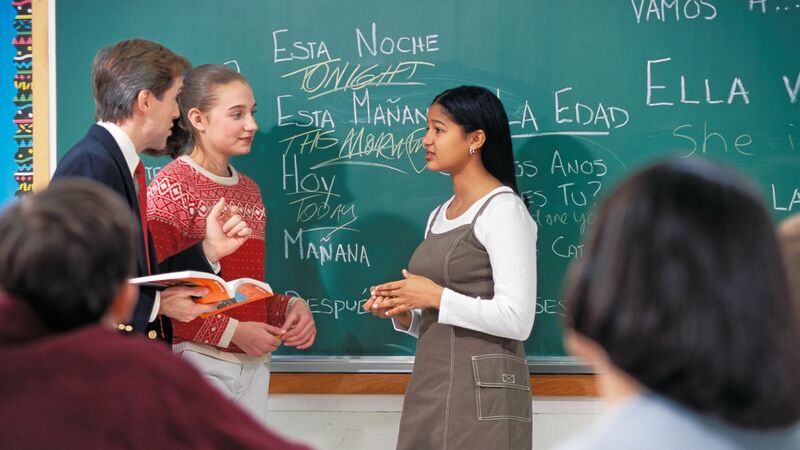 Every new world language teacher can relate to this scenario: Standing at the front of the room, you ask a question. The students don’t raise their hands, instead sinking further into their chairs. Some of them have anxious expressions, while others are in a daze. You hear yourself continue to speak and are filled with disappointment and frustration. It’s no secret that students are self-conscious and anxious about speaking in a new language, especially in front of their teacher and peers. However, this can be changed—with time, practice, and the right strategies, we can get students talking and using the language. Here are four strategies I use to increase participation in my classes. 1. Create a nonthreatening environment: First and foremost, it’s essential to create a classroom environment in which students feel that they can make mistakes. When students are comfortable, they’re more inclined to make the effort to contribute aloud. And learning a new language entails mistakes—they’re proof that students are learning and trying. Instead of penalizing students when they make a speaking error, give them a chance to self-correct. If they’re unable to do that, point out the error in a calm, friendly way. Ignoring the error entirely is not the answer, especially if it impedes communication, but you can point out in a way that encourages the student to keep trying. Similarly, if a student is stuck and doesn’t know what to say on the spot, model a response or provide a sentence starter. Smile as you implement these steps, to show that you’re happy the student is contributing. Greeting students at the door as they enter. Playing background music in the target language. Giving positive reinforcement, like complimenting a student on a specific skill, task, or attitude. 2. Use compelling photos to inspire students: This strategy requires us world language teachers to take a closer look at the speaking opportunities we give our students. Are we exposing them to compelling material? I used to use very basic questions to try to start discussions, such as: What did you do this weekend? What do you like to do in your free time? These questions encouraged some students to speak, but are they compelling, culturally relevant, or inspiring? No way. Do they lead to a discussion that everyone can participate in? Nope. These surface-level questions always fell flat. They were predictable and unimaginative, and inspired no creativity or critical thinking. Now I find real-life pictures related to the target culture for each unit of study. I go to Flickr and search for topics that are relevant to the unit we’re working on, like immigration, the causes and effects of global warming, family structures and traditions, or volunteerism. This takes a bit of time but is really worthwhile. Describe what you see in the picture, and the reaction it inspires in you. What is the first thing you noticed about this picture, and why? What is the connection between the picture and our current unit of study? Narrate a story that explains this picture. What does it mean to you? The possibilities are endless. Real pictures and photographs serve as cultural resources, giving your students a clear image of the culture represented. 3. Use engaging videos: In addition to pictures, video clips elicit more student responses and can lead to rich discussions at any ability level. While we often associate video clips with listening comprehension, try to use them as talking points, too. Video clips can include news and ads from YouTube, or try TED talks in the target language for upper-level courses—you can filter by language. Reactions: What did you think of this video? How do you feel after watching it? Comments and opinions: What are you thinking about upon watching this clip? What was the most informative part? Did you like this clip? Why or why not? Questions: Formulate questions you have upon watching this clip, or come up with a series of questions to ask your partner related to this clip. A video clip supports students because they don’t have to come up with a contribution to an open-ended question—they can talk about what they just watched. This may help students leave their comfort zones more easily, leading to increased participation. 4. Keep asking students questions to dig deeper: As students speak, spend more time listening to them and engaging with them. Try to extend their speaking time by asking follow-up questions before moving on to the next volunteer. For example, after a student shares their opinion of a video clip you’ve just shown to the class, ask them why they hold that opinion, or what factors shaped that perspective. If a student shares their impression of a photo, ask them what specific aspects of the picture led them to that impression. Be specific, and ask questions that address the why. Encouraging students to explain their thought process makes them more aware of their learning, and involves them in it. It also gives them more opportunities to use the language, which better prepares them to converse in a real context. In real life, conversations are two-sided, and they evolve. Let’s emulate that when speaking to our students. The more students speak, the more confident they will become. The result is a win-win situation for all.